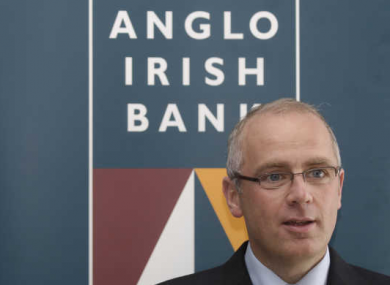 IT EMERGED LAST night that former Anglo Irish Bank Chief Executive David Drumm has been denied bail by an American judge. Drumm had asked for bail ahead of an extradition hearing in March, which could see him forced back to Ireland to face charges related to transactions at the doomed bank. Massachusetts Magistrate Judge Donald Cabell denied Drumm’s application, conceding that while Drumm did not represent a flight risk, he had “incentive to flee” based on the seriousness of the potential charges against him here. Drumm had argued that were he facing similar charges here, he would likely be granted bail and that Ireland had delayed seeking his extradition. He also said that the proceedings will take a number of years and he would be unable to adequately consult with his legal team. Cabell said that despite Drumm’s argument that he was his family’s sole breadwinner, “that possibility, however unfortunate, is present in almost every case where a defendant with family faces detention pending adjudication”. The court finds that all of these factors considered together still do not constitute a special circumstance. Rather, the Court is satisfied for purposes of the bail motion that Ireland has not unreasonably delayed in bringing charges or requesting the defendant’s extradition, that there is a diplomatic need to seek detention, and that there is no basis to believe the extradition proceeding will take an exceptionally long period of time to resolve. Email “David Drumm has been denied bail by a US judge”. Feedback on “David Drumm has been denied bail by a US judge”.